Krishnamacharya (shown right) was the principal guru/teacher to the three foremost Yoga teachers known to the modern world: T.K.V. Desikachar, B.K.S. Iyengar, and Sri K.Pattabhi Jois. 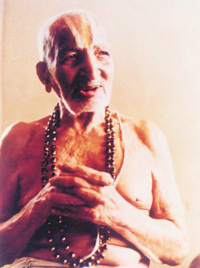 Krishnamacharya was a scholar of classical Sanskrit grammar and translator of the ancient Yoga texts, which detail the methods of Yoga in practice and philosophy. He is notably the most important influence on Yoga knowledge of the 20th century. Yoga and Ayurveda are the traditional medical practices of India with a common approach to health and healing, by viewing the person from a quantum perspective in which energy is more important than physical matter. The body is viewed as a series of energy channels full of currents, vibrations and pulsations. The blockage of these channels, or nadis, is seen as the fundamental cause of disease. Hatha yoga was created to help the practitioner achieve a meditative pose. This system is based on the principle that changes in consciousness can be brought about by setting in motion currents of subtle energy (prana), and aligning these currents with universal consciousness. In Hatha yoga every physical form, movement or action is preceded by a mental form, movement or action, and designed to place the nadis into specific spatial and energetic alignment. Through deep, even diaphramatic breathing with full expansion and complete contraction prana, the vital life force is mobilized, ultimately allowing for the release and free flow of energy throughout the body. Yoga comes from the ancient Sanskrit word root yuj, usually translated as meaning to yoke, bind, join, attach, or form a union. "This signifies what is at the core of yoga," says Kathryn Arnold, editor-in-chief of Yoga Journal. "Yoga is a unifying experience, between mind and body, the physical, the everyday, and the sacred." That in whom reside all beings and who resides in all beings, who is the giver of grace to all, the Supreme Soul of the universe, the limitless being --- I am that. That which permeates all, which nothing transcends and which, like the universal space around us, fills everything completely from within and without, that Supreme non-dual Brahman ---that thou art.